A new Bauble for Easter! On this bauble is a cheery little scene of dancing chicks and little chick eggs, against a backdrop of a summery feeling garden with flowers and a tree Cascading from the bauble is daisy and crystal embellished fringes and swags. 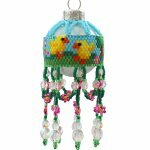 This Easter Chick Bauble bead pattern is made using Japanese Miyuki size 11 Delica beads and peyote or brick stitch can be used. It is assumed the beader will be familiar with either Brick, Peyote or Both. Peyote and Brick stitch bead instructions are available free on www.threadabead.com. Please note the pattern may not work with any other size and type of beads. There are 15 colours in total and the finished beadwork is approximately 3.5cm x 6.5cm. 28 x 4mm and 7 x 6mm crystal AB beads are required along with a 3cm bauble ornament. The bead pattern supplied is 10 pages and includes a colour chart of suggested delicas, a colour pattern and a numbered coloured pattern.